Health through water (from which the acronym SPA, salus per aquam derives) is a concept that becomes even truer and more important when you are on a seaside holiday. 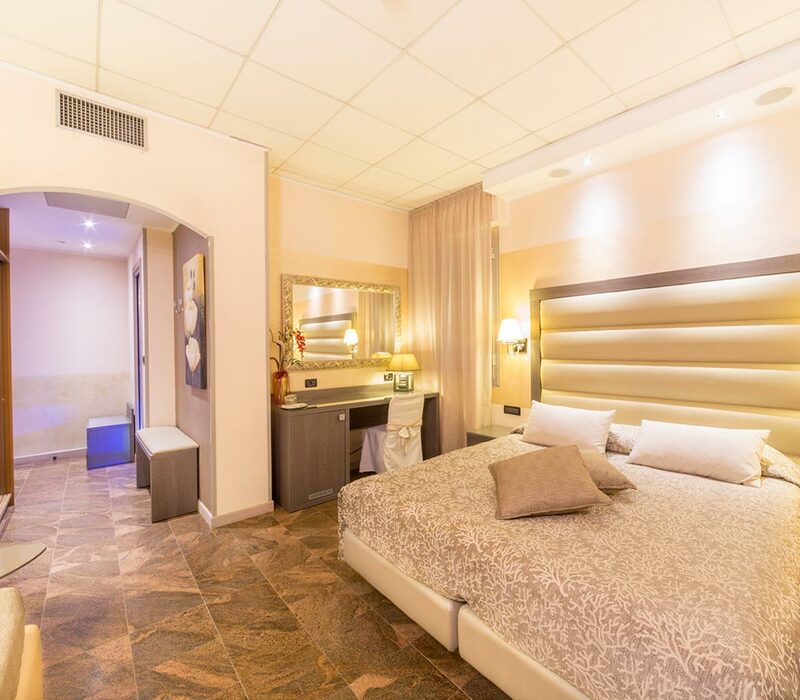 In order to guarantee you the utmost relaxation and enjoyment at the Hotel Torino Wellness & Spa we thought that our hotel would not be complete, above all, without swimming pools and a fully-equipped gym. You can find the first swimming pool outside the hotel; it is extremely large with two different depths for both adults and children, connected by means of a secondary, circular swimming pool, with a whirlpool bath and cervical cascade area. All around this, there is the solarium area with beach umbrellas and sun loungers served directly by the poolside restaurant. At the end of an intense day by the sea, what could be better than to let yourself be lulled by the movement of the water while enjoying the breath-taking view of the Ligurian Gulf? Try the thrills of the heated Jacuzzi whirlpool bathtub that you will find on the 5th panoramic floor. The whirlpool bathtub is connected to the wellness centre by means of a glass roof which can be covered or uncovered depending on the weather: your relaxation is always guaranteed! The large fully-equipped gym of the Hotel Torino Wellness & Spa is ideal for you to keep yourself in shape also during your seaside holiday. You can follow your training plan together with a personal trainer upon request, by making use of valid Fassi Sport machinery such as the treadmills, the reclining and elliptical exercise bikes, adjustable benches, dumb-bells, two-seat multi-function fitness equipment, rowing machine and many others. The gym is air conditioned and it also has a TV and a radio. 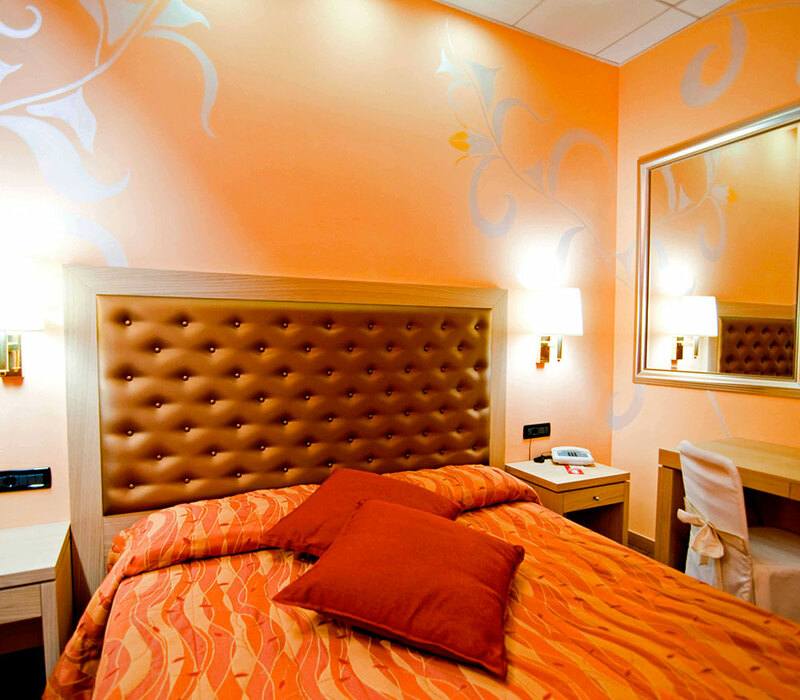 Brand new rooms which have a sensory whirlpool bathtub with chromotherapy in a bright, spacious shower with a cervical cascade. Total relaxation in excellent company! 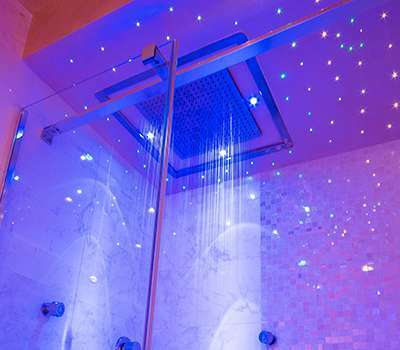 This room has a sensory whirlpool bathtub with chromotherapy in a bright, spacious shower with a cervical cascade. A splendid play of light for your holiday. This room is rich in details especially designed for your relaxation and wellness thanks to plays of light and perfume, apart from the beauty of the sensory bathtub with chromotherapy, a Turkish bath (steam bath) and a separate whirlpool bathtub is at your disposal. Look at all the other rooms!